The US embargo on military sales to Pakistan at the outbreak of 1965 Indo-Pak War was received with dismay and disbelief by the PAF, whose combat and training aircraft were totally of US origin. Already starting to get outclassed by more modern aircraft, the F-86Fs, F-104s and B-57s were now plagued by spares support problems that rendered them virtually worthless in the PAF. The C-in-C of the PAF, Air Marshal Nur Khan who had cannily led the force during the war, sensed the criticality of the situation and started an immediate search for suitable aircraft from new sources. Unfortunately for Pakistan, geopolitical realities restricted most available options. Pakistan’s CENTO and SEATO memberships hardly endeared her to the Soviets. The Indians had already made inroads to Moscow and the first shipment of six MiG-21s had made its operational debut during the 1965 War. The Soviets saw India not only as a socialist ideologue that could be helped militarily, but as its influential proxy and mouthpiece in the Non-Aligned Movement. The prospect of Soviets and Pakistanis developing any kind of patron-client linkage, thus, came to be a non-starter. China, in the throes of the Cultural Revolution, had not shown much interest in developing newer aircraft technologies for the time being. Content with the copy of Soviet-supplied MiG-19s, China mass-produced this single-role fighter in thousands. When Pakistan approached China for military help in 1966, she was only too glad to offer the F-6 as a token of friendship, the initial batch of 60 being free of cost. Though limited in range, speed and weapons payload, PAF inducted the aircraft and assigned it the day interceptor role with a secondary close air support task, which it dutifully went on to perform over the next 36 years. The MiG-19 (Mikoyan and Gurevich) was the first supersonic fighter of the Soviet-bloc, making its prototype debut in late 1953; it was contemporaneous with the North American F-100 Super Sabre, the first supersonic fighter of the West. The MiG-19 sported audaciously swept-back wings which, at 55 degrees, were considered the right answer to drag rise during high speed flight, but were also problematic at low speeds due to the lower lift-generating ability of such wings. Designers increased wing thickness to ensure enough lift at low speeds, but more lift meant more drag in another form. Two powerful afterburning RD-9B turbojet engines pushed the aircraft out of this jumble and gave it a respectable status of a transonic fighter which could race through to a top speed of Mach 1.3. A set of three hard-hitting 30-mm cannon and, in later versions, two first-generation K-13 heat-seeking missiles completed the weapons suite as the Soviet bloc’s frontline missile-armed interceptor. (PAF modified the aircraft to carry AIM-9B Sidewinder missiles.) The same set of cannon armed with armour-piercing bullets, along with two rocket pods, served a useful secondary close air support role. Pilots discovered that they could manoeuvre the aircraft with abandon as long as their speed was not below 500 kph and, they could effortlessly chase their prey if the speed was not above 1,000 kph. Outside these limits lay severe testing grounds requiring special nerves and lots of muscle. The F-6s were distributed amongst Nos 11, 23 and 25 Squadrons, each with 16 aircraft. No 11 Squadron, based at Sargodha, was commanded by Wg Cdr Sikandar M Khan. No 23 Squadron, the first Unit to be equipped with the F-6 in early 1966, was commanded by Wg Cdr S M H Hashmi; it had moved from its parent base Sargodha to the forward base at Risalewala, which formed the first tier of air defence against intruders from the east. No 25 Squadron, commanded by Wg Cdr Sa’ad A Hatmi, was split into two detachments of eight aircraft each, based at Sargodha and Mianwali. At the latter base, the detachment had the somewhat unconvincing task of guarding the ‘back-up’ strike assets including 10 B-57 and 5-odd Mirage IIIE for the all-important phase of Army’s main offensive. Air defence cover in West Pakistan was patchy at best, but at low level it had wide gaps and only 7% of the border had radar coverage. Raid reporting by the few rear-located low level radars was not expected to provide enough reaction time for a ground scramble. Similarly, reporting by mobile observers – which is based on visual or aural information – was likely to cause delays. An expedient solution was to mount combat air patrols over possible enemy ingress routes, round the clock, effort permitting. Wasteful though it was, it was decided to man several points in the air and all fighters were ordered up for this task. The F-6 came to be the workhorse for day air defence in the northern region. The morning of 4 December promised action as the IAF was expected to retaliate in response to PAF’s strikes against some of the Indian airfields the previous evening. The PAF was ready, with fighters continuously patrolling the skies since first light. No 23 Squadron pilots at Risalewala had been tidily scheduled for the day’s proceedings. Around 0930 hrs, as F-6s for the day’s sixth mission were taxiing out of their pens, an air raid warning was sounded. A mission abort was ordered and loudspeakers relayed instructions for everyone to take cover. Flt Lt Javed Latif who was on cockpit standby, started to unstrap from his F-6 for a quick egress. Momentarily glancing out of the pen opening to see what was going on, he was aghast to see a Su-7 diving down straight at his aircraft. “The scary sight of an intake pointing at me is still etched fresh in my memory,” recalls Latif. As he jumped out of his F-6 to take cover, a salvo of rockets landed smack on the pen. Still scampering towards a trench, Latif was rattled by cannon fire from the second Su-7 as the bullets landed a few yards away. Then the raid was over as suddenly as it had started, and the AAA died down too, as if heralding an all-clear. Dusting himself and recovering his composure, Latif rushed to his pen to help put out the fire caught by the hessian camouflage covering. Luckily, his F-6 was unharmed except for a few nicks from slivers of falling plaster. “I was seething with anger at having been violated thus, and hurried to strap up again to settle the score,” remembers Latif. Shortly thereafter, a scramble was ordered for the next pair but confusion reigned as the taxi way had been blocked by the F-6s of the previous aborted mission. This led to yet another abort at a critical time but the situation was salvaged when Latif, who was standing by for a later mission, took charge and hit the starter button on his own. Just as he was taxiing out, his crew chief came rushing towards the aircraft, signalling for a switch off as yet another air raid warning had been notified. “My mind was racing and I had already decided in a split of a second – I was going to take my chances flying and I was not going to repeat the fiasco of the last pair,” Latif recollects. Over-ruling the Air Traffic Control’s somewhat confused recall message, Latif checked if his No 2 was also taxiing out. Hearing no response, he decided to take-off alone. Changing over to the radar frequency, he heard an eager voice wanting to join up as his wingman. It was Flt Lt Riffat Munir on patrol from the fifth mission, whose leader had aborted due to a technical problem. The new partners were only too glad to find themselves as a viable combat entity again. It wasn’t long before the ground radar handed the pair over to ‘Killer Control,’ a cleverly-perched look-out tasked to visually guide the interceptors about the raiders’ position with the help of geographic landmarks. Flt Lt Ahmed Khattak’s confident voice called out that two Su-7s were pulling up for an attack from the north-westerly direction and pointed out their position over the main water tank. After jettisoning their drop tanks and charging their guns, Latif and Riffat confirmed visual contact with both Su-7s. As the attackers approached the airfield, Latif easily positioned behind one of them while Riffat cleared tails. Firing all three of his cannon, Latif waited for some fireworks. 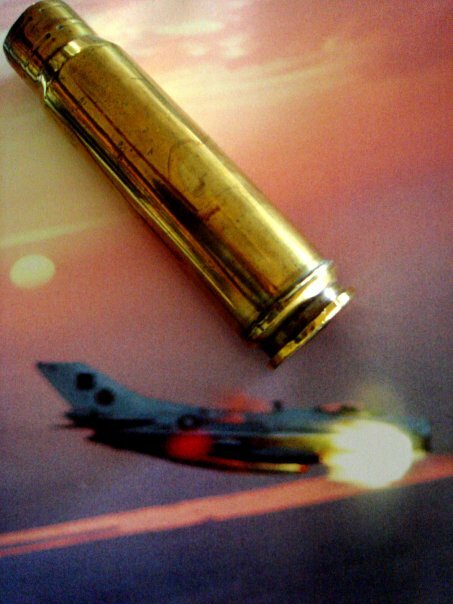 Noticing that the aircraft was still flying unharmed, he fired another long burst till all his ammunition was exhausted. Just as he was expecting his quarry to blow up, he felt a huge thud. Thinking that he had been hit by the other Su-7, he broke right and then reversed left but found no one in the rear quarters. Checking for damage, he found that the left missile was not there and the launcher was shattered. The AAA shells bursting in puffs all around the airfield confirmed his suspicion that he had taken a ‘friendly’ hit, but luckily the aircraft was fully under control. Pressing on, he started to look for the escaping Su-7s and within moments, was able to pick one of them trailing a streak of whitish smoke. Convinced that it was the same one he had hit earlier and, assuming it to be crippled, Latif decided to go for the other Su-7. He spotted it straight ahead, flying over the tree tops at a distance of two miles. Engaging afterburners, he closed in for a Sidewinder shot but could not get a lock-on tone. To his dismay, he realised that the missile tone was routed through the circuitry of the left missile which had been shot off. Getting below the Su-7, he fired without a tone nonetheless, half expecting it to connect, if at all it fired. Moments later, he heard Riffat’s excited voice on the radio, “Good shooting, leader, you got him!” Not sure if he had really hit him as he had not seen any explosion, Latif was soon relieved to see the Su-7 roll over inverted and hit the ground. Flt Lt Harvinder Singh of Halwara-based No 222 Squadron went down with his aircraft near Rurala Railway Station. Riffat’s chase of the second Su-7 (flown by the mission leader, Sqn Ldr B S Raje) had to be cut short as he was getting low on fuel and his leader was out of ammunition. No 23 Squadron had drawn first blood after an eventful morning that saw Latif doggedly in business after surviving rocket and AAA hits. For his heroics on the ground and in the air, Latif was awarded a Tamgha-i-Jur’at (Medal of Valour). Shortly before sunset on the same day, Sakesar radar reported a raid heading towards Mianwali. Sqn Ldr Ehsan and Flg Off Qazi Javed of No 25 Squadron, who were on ‘cockpit standby’ in the hessian-covered pens, started their F-6s and within minutes, were taxiing out for take-off. Just then, Javed reported seeing two Hunters pull up for an attack. Sensing that they had been caught on the ground at the wrong time, Ehsan decided on a hasty take-off and pushed up the throttles to execute a sharp turn on to the runway. Unfortunately, use of excessive power caused him to veer off into the ‘kutcha.’ Stuck in the mud, he became an unwitting spectator as the Hunters delivered their attacks. In the meantime, Javed decided to take-off without his leader. Just as he lined up, he saw the lead Hunter strafing way far to the left of the runway. With half his worries suddenly over, Javed started rolling but danger from the second Hunter remained, as it had all the time to aim carefully and take a hearty shot. Anxious, Javed craned his neck back only to see the Hunter’s cannon blazing at him. “I thought his dive was too shallow and, at the close distance he was, the bullets would overshoot,” Javed recalls his rather masterly prediction. Mercifully, the bullets did land 200 feet ahead and towards the left, so Javed continued his take-off. Once airborne, keeping the Hunter in sight was a problem in the fast-fading light. Speeding at 900 kph, Javed remembered that he had not jettisoned his drop tanks. When he did get rid of them at such a high speed, he induced a porpoise but was somehow able to ride it out. Charging in at 1,100 kph, he had closed in to about a mile and a half, which was just the right range for a Sidewinder shot. He fired his first missile and when he did not see it connect, fired the second one. That too went into the ground. “All this while the Hunter pilot seemed totally oblivious of what was going on and his leader was nowhere in sight, so I gleefully decided to press on for a gun attack,” says Javed. “Since things had been happening too fast, I had forgotten to charge my guns after take-off. Having done that, I first fired with my centre gun till all its ammunition was spent. With the Hunter still flying unharmed, I decided to continue firing with the side guns. After a few frustrating bursts, I closed in to about 1,000 ft and fired a real lengthy one. Luckily, the last few bullets of the volley struck the right wing as I noticed a flash. The aircraft pitched up and rolled over to the right. I only learnt of the pilot’s ejection later, as I had to break away to avoid overshooting the out-of-control Hunter.” The aircraft fell about 14 nautical miles north-east of Mianwali. Flg Off Vidyadhar Chati of the Pathankot-based No 27 Squadron, when interrogated about the circumstances of his shooting down, said he suspected he had been brought down by ground fire! Duck shoot it was, over the idyllic Khabbaki Lake, but Chati should have known better where the bullets really came from. Ironically, the pilots of No 27 Squadron who had been declared the ‘Top Guns’ of IAF’s Western Air Command during a gunnery meet prior to the war, had failed to shoot up the conspicuously exposed F-6s on the runway. For the rookie Javed, who was freshly out of operational training on the F-6, remaining cool under fire was a most worthy achievement and he deservedly won a Sitara-i-Jur’at (Star of Valour) for his daring deed. The high-powered FPS-20 radar at Sakesar, had received considerable attention on the first day of the war. Shortly after mid-day on 5 December, a pair of Hunters from No 27 Squadron was again able to sneak in and attack the radar with rockets and cannon. Patrolling nearby, over the picturesque Salt Range, were two F-6s of No 25 Squadron flown by Wg Cdr Sa’ad Hatmi and Flt Lt Shahid Raza. They were immediately vectored by the radar towards the exiting Hunters but it was a while before Hatmi spotted the pair. As the Hunters sped away over the hilly terrain, Hatmi wisely decided not to waste his missiles in the unfavourable background clutter. Using his guns instead, he made short work of one of the Hunters which fell 15 miles east of Sakesar. The pilot, Flg Off Kishan Lal Malkani, was killed. Next, Flt Lt Shahid Raza, who had all along kept the second Hunter in sight, closed in and opened fire with his guns which found their mark. The pilot, Flt Lt Gurdev Singh Rai, who was the leader of the mission and, had twice visited Sakesar on the previous day, ran out of luck this time. He met his end when his Hunter crashed near the small town of Katha Saghral at the foothills of Salt Range. On one occasion the F-6 was completely outwitted by a Su-7. Flt Lt S S Malhotra of No 32 Squadron, who was on a photo recce mission over Risalewala on 13 December, spotted a patrolling F-6 and took a pot shot before exiting. It was only later that Malhotra learnt of Flt Lt Ejazuddin’s ejection over his home Base. F-6s flew a total of 674 day air defence sorties (including 42 sorties over the battle area) which was 40% of PAF’s day air defence effort. Five enemy aircraft were downed during the air defence missions, or a kill rate of 0.74% in the role of an air defence fighter. All interceptions took place after the raiders had released their weapons on their targets, which was a reflection of the inadequacy of the air defence system that had been unable to provide sufficient early warning. The saving grace was the ability of the powerful F-6 to accelerate fast and nab the escaping raiders. PAF’s concept of air support to the land forces was biased towards direct support (close air support, armed recce and battlefield interdiction), as it was seen to yield immediate results in the ongoing battle. Indirect support in the form of deep interdiction beyond the battlefield was considered an exercise wrought with uncertainties in a short war, as the severance of the supply chain was likely to take some time before it showed its effects on a well-stocked front. The F-6 fitted well into the scheme of direct support as its powerful 3x30-mm cannon were ideal for strafing of convoys and rolling stock during armed recce, while two pods holding 8x57-mm rockets  each, offered the option of firing a salvo in the midst of an armour concentration. F-6s found their calling in Shakargarh sector, where the Indians had launched a two-pronged offensive with two infantry divisions along with two armoured brigades, while a third division was deployed in a defensive role. Against this force was Pakistan Army’s beleaguered 8 Infantry Division trying to fight off the massive onslaught, while 8 Armoured Brigade, staunchly but unsuccessfully, tried to launch a belated counter-attack. This sector saw PAF intervening in great force, with the bulk of air support missions flown for 8 Division. F-6s flew all but 9 of their 139 close air support and armed recce sorties in this sector  but, regrettably, the mission success was very low; almost half the sorties were wasted as no enemy activity was observed in the area of interest. Hazy winter conditions as well as abundance of natural camouflage and dense habitation contributed majorly to the problem, though wrong reports by the Army were also partly to blame. While it must have been very frustrating for the pilots not to find the ‘armour concentrations’ that the tasking orders promised, they more than made up whenever they stumbled upon them. An exciting situation developed in one of the close air support missions on the morning of 7 December, when four F-6s of No 11 Squadron found themselves vying for airspace with four Su-7s, which also happened to be on a similar mission near Zafarwal in the Shakargarh salient. The moment the Su-7s sighted the F-6s pulling up for their attack, they lit afterburners and started to exit eastwards. At that time the No 2 called that he had been hit by AAA so he was asked by the mission leader, Flt Lt Atiq Sufi, to pair up with No 4 and recover back. Atiq then smartly ordered a split, so that two F-6s were chasing a pair of Su-7s each. “I remember accelerating to 1,100 kph despite the rocket pods which were retained, as I could not afford to take my eyes off the prey to look inside for the selective jettison switches,” says Atiq. He barely managed to arrest his rate of closure and opened fire on his target with the centre gun. “I had expended the ammunition in the centre gun so I switched to the two side guns and continued firing. A well-aimed volley struck right behind the cockpit and the Su-7 rolled over its back,” remembers Atiq. It was later learnt that Sqn Ldr Jiwa Singh, the senior flight commander of Adampur-based No 26 Squadron had gone down with the aircraft, south-west of Samba just over the border. The F-6 deputy leader, Flt Lt Mus’haf Mir also fired at one of the fast-receding Su-7s but it was lucky to have accelerated away, apparently unscathed. A brief scrap took place between ‘relatives’ of the MiG family on 14 December when three F-6s of No 11 Squadron, which were on an armed recce mission in Shakargarh area, sighted four patrolling MiG-21s. Flt Lt Aamer Sharief manouvred behind one of the trailing aircraft and fired a Sidewinder. The outcome of the claim has remained moot as the engagement took place in enemy-controlled territory and, no further details of the wreckage or pilot status have emerged ever since. PAF lost two F-6s to ground fire during the tactical air support campaign. Flt Lt Wajid Ali Khan of No 11 Squadron was shot down by AAA near Marala Headworks on 7 December; he ejected but ended up as a POW after being picked up by Indian troops which were in the vicinity. The other casualty was Flt Lt Shahid Raza of No 25 Squadron who was shot down by AAA near Shakargarh on 17 December, the last day of the war; he was heard to be ejecting in enemy-controlled territory but his fate remained unclear. He was awarded a Tamgha-i-Jur’at for devotion to duty, as well as professionalism shown in his earlier Hunter kill. The 139 sorties of close air support flown by the F-6 were a mere 20% of PAF’s daytime tactical air support effort, with the bulk flown by F-86E & F. Considering the eminent suitability of the F-6 for the task, a larger share could have been more advantageous. The F-6 detachment at Mianwali was hardly any help in this regard, as it was too far removed from the battle scene; it belatedly flew into Sargodha for air support duties a day before the war ended. Nonetheless, a total of 33 tanks, 42 vehicles and 4 guns were claimed by F-6 pilots in the 80 sorties that were considered successful. It can be seen that this was a useful contribution by the F-6 squadrons to 8 Division’s efforts in stemming the Indian offensive in Shakargarh salient. During the 14-day war, the F-6s flew a total of 821 sorties which was 28% of PAF’s overall war effort of 2,955 sorties. For a relatively new weapon system, the F-6 could have achieved an aircraft Utilisation Rate better than the 1.6 sorties per aircraft per day during the war. While it fell short of the planned 2.2 sorties daily, it reflected a cautious conduct of the war, whereby the PAF was held back so that everything could be thrown in during the army’s main offensive which, in the event, never came through. Besides the individual gallantry awards won by F-6 pilots, Nos 23 and No 25 Squadron were awarded Squadron Colours for distinguished performance during the war. The battle honours are as much a tribute to the F-6 as its spirited pilots, who forged this spartan aircraft into one of PAF’s most robust and dependable war machines. A later model, the MiG-19PM, had a rudimentary radar and could carry four beam-riding missiles, while dispensing with the cannon. The pilot of this Su-7 was OC of No 222 Squadron, Wg Cdr Allan Albert da Costa. A warhead’s proximity detonation, unlike a direct hit, may not cause an explosion every time. It was advisable to fire the centre gun and side guns separately to prevent rattle and vibrations, which could loosen or dislodge electrical connectors of radios, etc. The pilot belonged to the Tactics & Air Combat Development Establishment based at Ambala. Wreckage of Afzal’s F-6 revealed Sidewinder warhead shrapnel embedded in the exhaust area, which quashed speculation that the F-6 may have flown through Kadam’s exploding Su-7. PAF modified the F-6 to carry 68-mm rocket launchers in 1979. Utilisation Rate is based on an average aircraft serviceability of 75%. The F-6 wartime UR is calculated thus: UR = 821 sorties ÷ 36 aircraft ÷ 14 days = 1.6. This article was published in Defence Journal, December 2009 issue. I am writing this on this blog because your other blog does not have a comments section in it. Sir is it possible for you to do an analysis of the region's fighter aircraft, based on the extensive knowledge as an aviator and an Air force officer, and above all your blunt honesty. It would be great indeed to know the positives and negatives of the fighter aircraft, other support aircraft in the region. This can serve as an authentic quotable source of information to all military aviation enthusiasts.